There were several factors that led to the writing of this novel. One was my passion for current events, specifically in Africa, a continent in which I’ve always had a keen interest. The other is my fascination with the role fate plays in our lives. I began writing the novel Sometimes the Darkness in 2005. At that time, the war in Darfur, which began in 2003, was receiving constant coverage by many of the news outlets at that time. It is important to remember that there were significantly less news groups in operation then as now. Even so, the war and the atrocities associated with it (as there is with every war) received much coverage, enough to draw my interest and study. The causes of this conflict were numerous. Economics, tribalism, territorial issues, ethic/religious issues and disputes all contributed to the start and continuation of that conflict in this western region of Sudan. Sudan, including South Sudan, formed in 2011, is the largest country on the continent. It is, by comparison, ten times larger than the United Kingdom. All of this led to the idea of a novel with the conflict in Darfur, Sudan as an event generating complex situations for the prime characters, the American Hanley Martin and the French nun, Sister Marie Claire. The decisions people make, the factors that influence those decisions, why they make them and when, specifically life altering decisions, has always been a source of fascination for me. Once, a father of a friend of mine, a businessman and friend of my parents, saw me exiting a pharmacy in the small town near where I grew-up and invited me to lunch. I was home for holiday break from the university I attended and on an errand for my aunt. It was a chilly, gray overcast day in early December. It turned out his invitation to buy me a sandwich was an opportunity to ask me about his son, who was attending another college several states away. I knew that my friend, who was close to his father in some ways, seldom came home from school and was, apparently, uncommunicative, as children of that age often are. His father wanted to know if I or my brother had heard from him. During the conversation, my friend’s father began discussing fate and decisions. He said he had read a magazine article which examined circumstance and the factors that changed an every day occurrence into a tragedy. He said this particular article used a car wreck as an example. If every automobile accident needed five factors to always be present to happen, how often do we find ourselves in a situation while driving where two, three or even four of those factors are present and we pass through that moment without incident. Had that fifth factor been present, then our lives might have been drastically different. What role does fate play for us as we move through our lives? Hanley Martin, still relatively new to Sudan and his life working at the Catholic mission at Mapuordit, experiences the war for the first time, as the mission comes under fire from forces hidden in the distance bush. The wood of the doorframe above the head of another nurse exploded, raining splinters over everyone nearby. Just as the wood began filling the air around the door, Hanley heard the faint crack of a gunshot; the distance was significant as the report was faint. Someone screamed, a child, but only one. Everyone in the clinic reflexively squatted down to the floor, everyone but Hanley. Sister Marie Claire hissed, “Get down” to the American but he stayed up, and turned toward the sound of the gunshot, on tip-toe, trying to look through the small, high window for the shooter in the bush beyond the clearing. A second bullet hit the cement block wall with enough force that Hanley felt it through the dirt floor into his boots. It would have hit Hanley just below his rib cage but for the impenetrability of the block. Hanley ducked down, a feeling of nakedness a surprise to him as he wondered what he should do. He thought that perhaps only an American has a first reaction of regret at not being armed when faced with attack. He would trade anything for a rifle at that moment, the bigger the better he thought. There was another crack of rifle fire but this shot failed to hit the building. “Stay down,” The nun instructed as she and the other nurses made certain the children remained on the floor and did not run for the doors. No one made a sound. The children did not cry but remained composed, their sullen expressions nurtured by a short life filled with the threat of violence. Another round struck the building and then the sound of automatic gunfire could be heard in the distance. Three short bursts, ten seconds of silence and then a single shot. No one moved for another minute or so. Hanley stood slightly and walked, bent over, to the door and went outside. “No,” the nun said but he was past her and out before she could move. Outside, Hanley moved down along the gray block, straining to hear any movement, the approach of men through the brush. He heard nothing. The entire compound had gone prone, waiting for the appropriate number of minutes to pass, a unit of time that experience randomly chose as enough. Hanley, bent over as he walked, made it to the corner of the building and surveyed the compound. He saw several people lying on the ground, others sitting behind trees, away from where they believed the gunfire was coming; some lying beneath a large truck, the one that had arrived late last night, he suspected. No one moved. Hanley slowly peeked around the corner of the building and looked in the direction from where he thought the shots had come. He stared into the bush and trees, squinting, trying to force his eyes into being more efficient. He could feel his eyes resisting. Maybe they didn’t want to see what was out there he thought. “You’ve always been good, but I didn’t realize you were also smart,” he said aloud to his eyes. When a hand touched his shoulder, Hanley twisted around quickly, producing a pain in his lower back, causing him to reach back to find the muscle that cramped. “Are you trying to get yourself shot?” a harsh whisper asked. Sister Marie Claire held on to his shoulder, which did not help the pain. “No. Do you really believe I would?” Hanley said rubbing his back muscle to make the pain go away. The shirt he was wearing was soaked through but he hadn’t notice until he grabbed for his back. The nun hung on, pulling Hanley back from the corner of the building. The pain started to fade and he turned, wrenching his shoulder away from her grip. “Well, then get shot, I really shouldn’t care,” she said. He expected to hear her walk away but she stayed right behind him. Hanley saw that the man who had found shelter behind the tree was starting to move. Slowly he slid down to lay on his back and then carefully rolled over making certain most of his body remained protected by the tree. He then slowly peered around to look in the direction of the gunfire. The man and the tree were maybe sixty feet from the children’s clinic. As Hanley watched, he noticed the tree had sustained damage but the harm was not new; the bark was marred, badly marred. “The trees have saved some lives it seems,” Hanley said. “How often does this happen?” he asked. She did not answer and Hanley turned slightly to see why. The nun was moving back toward the other end of the building, toward a dense bit of brush at the edge of the clearing near the far end of the clinic. Hanley watched her movements for a second and then looked beyond toward the edge of the clearing. An arm and hand protruded from the dense brush, the dark skin stark against the light brown grass and dust. The nun was running, shouting for help to the others in the clinic. Hanley ran for her, knowing she was about to put herself in danger. As he cleared the edge of the building, he stopped and crouched, looking to where the shots had come from. Jolted by an immediate shame, he straightened and ran hard to where the nun had fallen to her knees. She had not stopped, had not hesitated for an instant; but he had. She was half into the high grass, bent over the head of the child, pushing down on the grass, creating some space to work. Hanley caught up to her and when he saw the girl’s head he turned away, bile rising to his throat. His mouth wide open, he gasped for air and choked back the acid rising to his lips. Spitting out the sour waste, he was aware of two more nuns running past, silent and scared; they had seen this before; this kind of death, a child’s death, wasteful, horrid, stupid. The kind of death men cause; the kind women don’t understand but have learned to deal with. No one should learn to accept this, Hanley thought. It was the girl the nuns had just treated before the gunfire started, the girl from west of Rumbek, the beautiful girl whose mother had been raped and beaten to death. The entire left side of her head was missing, the bullet, the one that had not struck the building, had pierced her skull just above and slightly behind her right ear; it made mush of her brain and exited taking most of her head as a souvenir. American Hanley Martin is troubled by his success. A wealthy aerospace industrialist, he was taught he should help others as a means of balancing the scales for his good fortune. He searches for ways to give back that will comfort his soul. A trip to the Paris Air Show in 1999 changes the course of Martin’s life when the head of a Catholic mission in southern Sudan tells him of the need for pilots to fly medical supplies and visiting doctors to and from their remote clinic and school in Mapuordit, which sits on the refugee trail from Darfur to Kenya. Sister Marie Claire, a French nun working at the Mapuordit mission, helps the Sudanese people fleeing the war in Darfur. She’s crafted a network of volunteers to save the children sold into slavery and forced to work in the country’s more prosperous cities. She needs only one additional piece to complete her plan. As Hanley Martin and his plane arrive at Mapuordit, she asks herself if the American may be the answer to her prayers. 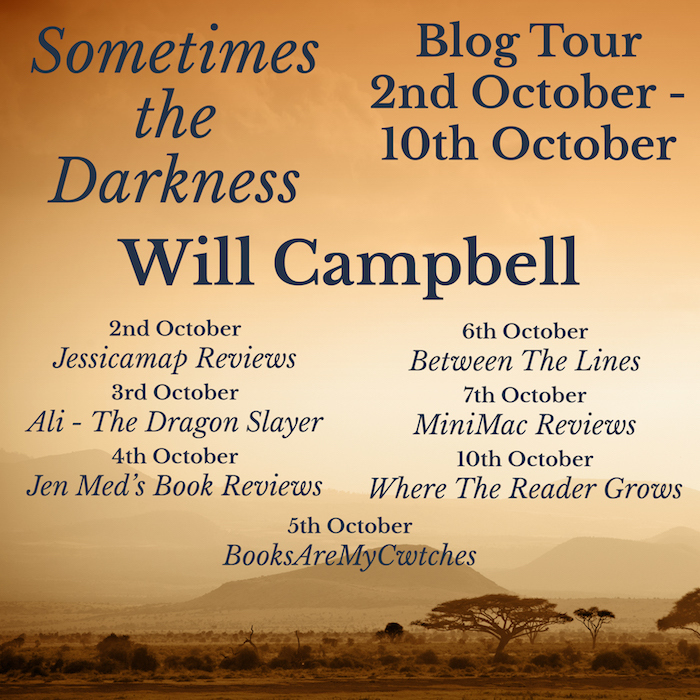 Sometimes the Darkness is the first novel by the author Will Campbell. It tells the story of two people brought together by fate and the price they pay helping a horrific war’s most vulnerable victims. Will Campbell is the pen name of Stephen Weir. He lives in Charleston and Greenville, WV. Stephen Weir is a former certified economic developer (CEcD) with over thirty years experience managing economic development organisations from the city to state level. He has also worked in international trade, helping establish the West Virginia’s first international trade office in Nagoya, Japan. He has previously published economic development articles and op-ed pieces in the Economic Development Review, West Virginia Executive Magazine and the Charleston Daily Mail and Gazette. His interest in politics, literature and writing led to the penning of his debut novel.